NEW YORK (Reuters Health) - Patients in areas of the U.S. where thyroid ultrasound has increasingly been used for initial imaging are more likely to be diagnosed with thyroid cancer, with the greatest increase among adults over 65, new research suggests. "We found that over time, there has been an increase in the use of thyroid ultrasound as initial imaging. After controlling for time and demographics, area-level use of thyroid ultrasound as initial imaging was associated with area-level thyroid-cancer incidence, including incidence of localized papillary thyroid cancer with tumor 1 cm or smaller," . We need to be able to distinguish the few patients who have high-risk thyroid cancer and may ultimately die from their cancer from the many patients with low-risk, potentially indolent thyroid cancer who may be at greater risk from harm from the treatments. According to this model, between 2003 and 2013, at least 6,594 individuals 65 and above - disproportionately women and patients with comorbidities - were diagnosed with thyroid cancer due to increased use of thyroid ultrasound. 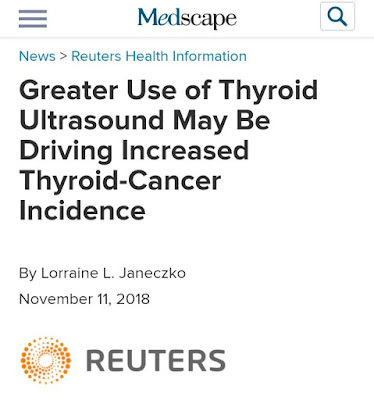 "A major strength of this study was our ability to use two complementary databases (Medicare and SEER-Medicare) to evaluate area-level imaging and area-level incidence of thyroid cancer over time,"
Patients age 65 and above was an appropriate cohort because older adults have both the largest change in thyroid cancer incidence and the greatest risks from downstream treatments. Similar trends in thyroid cancer incidence are seen in younger adults, so it is plausible that these findings are generalizable to adults under 65. Three clinicians who were not involved in the study share the authors' advice for judicious use of thyroid ultrasound. Dr. Ronald N. Cohen, an associate professor of medicine at the University of Chicago in Illinois, said by email, "We should be using American Thyroid Association guidelines to decide which thyroid nodules should actually be biopsied, as we do not need to biopsy every one. Instead, we need to focus on those nodules and patients that seem to be at higher risk of clinically significant thyroid cancers." Dr. Arti Bhan, an endocrinologist at Henry Ford Health System in Detroit, noted by email, "These findings confirm data from other such studies that point to excess use of imaging modalities, which has resulted in an epidemic of thyroid cancer in the US and other parts of the world." "Even though there may be a true rise in the incidence of thyroid cancer due to factors not yet elucidated, the vast majority of these incidentally detected cancers are low-risk," she added. Dr. Bhan recommends that doctors "use guidelines provided by major medical societies regarding thyroid nodules so detected." Given the data from this study, she said, "physicians can reassure patients that not all thyroid nodules need to be worked up and that non-invasive follow-up over time may be sufficient for the vast majority of incidentally detected nodules." Dr. Cary N. Mariash, a professor of clinical medicine at Indiana University School of Medicine in Indianapolis, advised by phone, "Before ordering an ultrasound, one should think about what the ultimate consequence might be. Are you doing an ultrasound on someone who might not have any significant thyroid cancer, but once you do it, you're headed down the road to biopsy and perhaps surgical intervention?" "The consequences really need to be thought through before the ultrasound is ordered," he concluded.